I'm all for funky "holiday" days... National Chocolate Chip Day, National Waffle Day, Bubble Wrap Appreciation Day. Yep, they're all silly, but they also make the month a little brighter. And if you can't celebrate the little things in life, then .... you're in trouble! One day, however, has me irked. 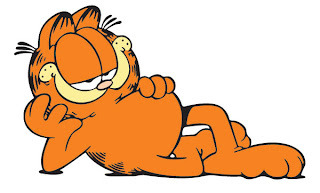 June 19 is Garfield the Cat Day. I am not a cat person & I normally wouldn't let my prejudice stand in the way of such an occasion -- but if Snoopy doesn't have his own day, then I just cannot have Garfield Day.